Saturday February 14th 1891 I worked very hard all the forenoon as I had baking to do. I got through and Will took me over to see Fanny in the afternoon. Lizzie stayed here while we were gone. We spent the evening pleasantly at home. Sunday February 15th 1891 I got the work done to go to church this morning. We attended the Presbyterian. Were not so very well pleased with it. The afternoon and evening we spent at home reading and talking. It was a very pleasant day. Monday February 16th 1891 I walked over town this morning. I had a talk with Ott and was down to Hatties a little while. She had a letter from Mother. I got dinner after I come home and did some work up stairs in the afternoon. Will brought the last load from the west farm. We spent the evening at home. It was a disagreeable afternoon. 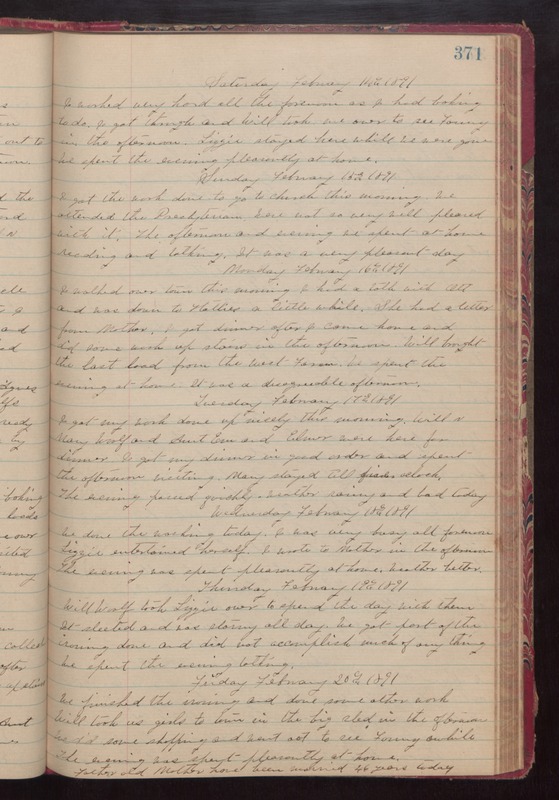 Tuesday February 17th 1891 I got my work done up nicely this morning. Will & Mary Woolf and Aunt Em and Elmer were here for dinner. I got my dinner in good order and spent the afternoon visiting. Mary stayed till five oclock. The evening passed quickly. weather rainy and bad today. Wednesday February 18th 1891 We done the washing today. I was very busy all forenoon. Lizzie entertained herself. I wrote to Mother in the afternoon. The evening was spent pleasantly at home. weather better. Thursday February 19th 1891 Will Woolf took Lizzie over to spend the day with them. It sleeted and was stormy all day. We got part of the ironing done and did not accomplish much of any thing. We spent the evening talking. Friday February 20th 1891 We finished the ironing and done some other work. Will took us girls to town in the big sled in the afternoon. We did some shopping and went out to see Fanny awhile. The evening was spent pleasantly at home. Father and Mother have been married 46 years today.